The autochthonous Garrano breed, beyond its relevance in historical and cultural level, is one important reservoir of national genetic variability. Since 1943 a group have lived freely in Peneda-Gerês National Park. A study made from November 2012 to April of 2013 shows that this animals are very parasitized, but they don’t present a concerning inbreeding level. There are good reasons to look to the future of this valuable biologic resource. Some animals of the wild Garrano core from PGNP. Vidoal (around 1300-1400 m of height), Serra do Gerês. January of 2013. 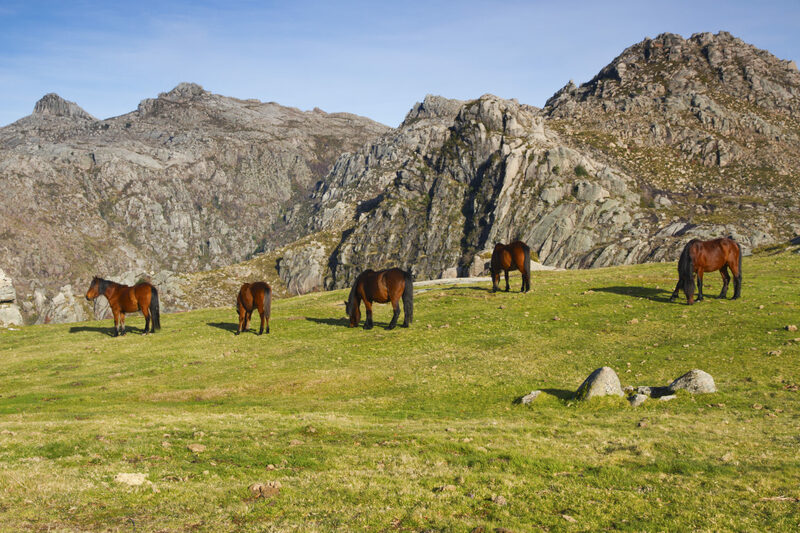 One of the species that stands out the most in Peneda-Gerês National Park (PGNP) is the Garrano pony, one of the three Portuguese horse breeds (alongside the Lusitano and the Sorraia). They are small individuals with broad shoulders, a thick neck and abundant manes and fur (Andrade, 1938). They have been in the Iberian Peninsula since the Quaternary period of geological history (Andrade,1938; Oom, 1992; Gomes, 1996). This makes the Garrano the primitive rebel from the North. During the application process of the Garrano as national heritage, intending to avoid its extinction, a group of students from Colégio Valsassina developed a study on the Garranos of PGNP, from November 2012 to April of 2013. The results reveal a high level of parasitism, with a 100% level of strongylids prevalence, in fact, these data were already verified by Gomes (1996) in 1994-95, when it was registered a higher average level of eggs per gram of faeces. Despite the facts, it will be much difficult to reduce the levels of parasitism. On one hand, the animals live freely. On the other hand, many of the used pastures are probably contaminated, which facilitates “recontamination”. Notwithstanding, it’s considered important to develop a monitoring program of parasitism level. In spite of not deworming the animals, the information is always important (Branco and Osório, 2012). The inbreeding level of the group was studied too, using the Pedigree Viewer program. The data shows that the age average of the population is a little higher than the adult age (6,62 years old) and it seems that there are not problems referring to the inbreeding possibility between individuals. Considering “1” (certain) as the maximum probability of occurrence of an inbreeding situation and “0” (impossibility) as the minimum probability, it was verified a maximum of 0,1875. The modal result was 0. Therefore, it is not foreseeable that this factor would jeopardize the population and the progeny viability of the current generation. However, the low number of individuals could compromise the future of the population, once its variability could become diminished. To avoid this situation, it’s advised a recurrent introduction of new individuals “alien to” the group in order to keep an acceptable level of variability (Oom, 1978). 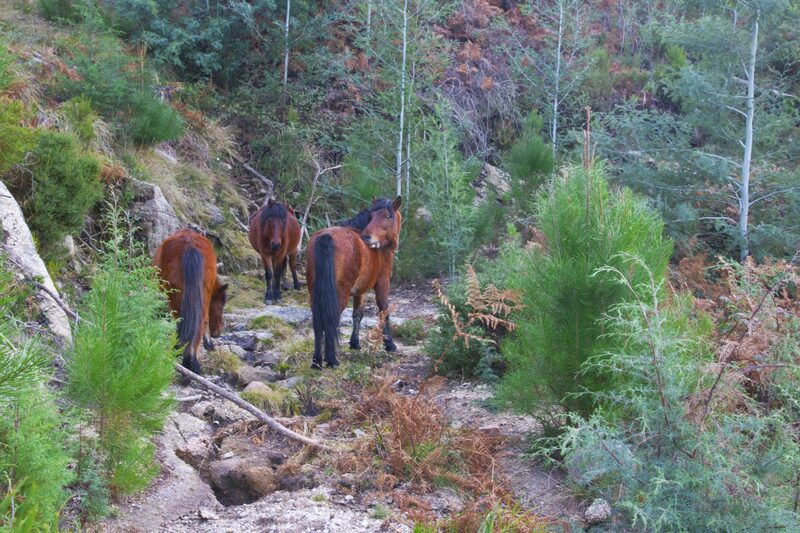 In Peneda-Gerês National Park examples of the Garrano breed could be witnessed in freedom after a measure had been taken by the undersecretary of State of Agriculture, in 1943, which led to the composition of a group of 21 Garranos in order to preserve the breed in freedom. Photo: Encosta do Pisco (around 700 m of height). Serra do Gerês. January of 2013. According to António Rebelo, a technician of the PGNP responsible for the monitoring the Garranos in the field, the current group is only composed by 15 animals. Everything point out a register of an effective population regression in the last years, specifically, comparing with the situation of 1994-96, described by Gomes (1996). However, the fact of existing five males (ally to a low level of inbreeding in the population) could be potential a positive factor for the effective raise of the population in short or medium term. To Maria do Mar Oom, from Faculty of Science of the University of Lisbon and ambassador of the breed in the application to national heritage, the Garrano, beyond its relevance in historical and cultural level, is one important reservoir of national genetic variability. The developed efforts with the aim of conservation and support of the breeders are fundamental, which ensure a sustained use of this genetic resource from the mountain rural environment of the Portugal North, where they have been since the Paleolithic. From the legal framework, the national park continues presenting conditions to preserve this important biological resource, integrating genetic, environmental, social and cultural perspective. Andrade, R. D. (1938) Garranos. Boletim Pecuário, Ano VI (2), 281-292. Branco, F. E.; Osório, B. G. (2011). Estudo do parasitismo gastrintestinal de três núcleos de Equídeos na Coudelaria de Alter Real – Portugal. Dissertação para obtenção do Grau de Mestre em Engenharia Zootécnica – Produção Animal. Instituto Superior de Agronomia da Universidade Técnica de Lisboa. Gomes, J. (1996). Bases para a Conservação e Gestão do Garrano no Parque Nacional da Peneda-Gerês . Professionalizing intership report to the obtaining the degree in Faunal and Enviromental Resouces. Faculdade de Ciências, Universidade de Lisboa, Lisboa, Portugal . Oom, M. d., & Reis, M. S. (1978). Estudo Eto-Ecológico do núcleo de garranos bravios da raça luso-galiziana (Equos cabellus L. 1758) do Parque Nacional da Peneda-Gerês. Internship report. Lisboa: Universidade de Lisboa. Oom, M. D. M. J. F. (1992) O Cavalo Lusitano, uma raça em recuperação [PhD]. Lisboa: Universidade de Lisboa, Portugal, 281 pp. Parque Nacional da Peneda-Gerês. (s.d.). Parque Nacional da Peneda Gerês. Obtained in 28/03/2013, from Parque Nacional da Peneda-Gerês: http://www.geira.pt/pnpg/index.html Parque Nacional da Peneda-Gerês. (s.d.). Parque Nacional da Peneda-Gerês. Obtained in 28/03/2013, from Parque Nacional da Peneda-Gerês. Cyasthostomum spp., Trichostrongylus e Poteriostomum spp. Cyasthostomum spp., Strongylus vulgaris, Gyalocephalus capitatus e Trichostrongylus spp. Cyasthostomum spp. e Poteriostomum spp. Data in analysis of the Garrano population of PNPG parasitism (methods of flotation of Willis, of natural sedimentation, of MacMaster and of the infective larvae that were in the faecal cultures). Total population: 15; Studied animals: 12. Legend: EPG – Eggs per gram. The strongylids group presents a prevalence of 100%, with an average of 266,67 EPG. Cyathosminae presents prevalence of 16,7%, showing an average of 8,33 EPG. Strongyloides westeri presents a prevalence of 8,3%, with an average of 8,33 EPG. The faecal cultures present as modal results the infective larvae species of Cyasthostomum spp.. Related to the prevalence, Cyasthostomum spp. has 100% level, while Poteriostomum spp., Strongylus vulgaris, Strongylus equines, Gyalocephalus capitatus and Trichostrongylus spp. Have a prevalence of 16,7%. Related to Cyathosminae, it could be stated that, comparing with the results of Branco and Osório (2011), the most similar average levels of parasitism of the PNPG Garranos are the ones of Alter. Ana Catarina Caçote, Gonçalo Pereira, Joana Duarte, Mariana Monteiro. This work wouldn’t have been possible without the precious collaboration of Doctor Maria do Mar Oom, from Faculty of Science of the University of Lisbon, and a technician of the Peneda-Gerês National Park, António Rebelo, for all the time, help and availability, essential to the execution of our project. We would also like to thank the Peneda-Gerês National Park for the available help.